FA Omega-3 is a supplement with a high content of omega-3 fatty acids : EPA (eicosapentaenoic acid) and DHA (docosahexaenoic acid). These fats oxidise quickly. Because of that, the ingredients have been selected carefully to avoid their toxicity and represent the highest quality in the market. Eicosapentaenoic acid (EPA) is found in great amounts in high-quality fish, i.e. salmon, mackerel and sardines. It relieves inflammations and is one of the most important formulas used in in treating depression, mood and psychosomatic disorders. Docosahexaenoic acid (DHA) – the best absorbable omega-3 fatty acid. It has an important role in the development of cognitive functions, improves concentration and memory in children, adults and the elderly. It helps to learn faster and is effective in fighting hypertension. Omega-3 fatty acids are essential fatty acids (EFAs) which have a variety of functions in our body. The brain needs them (especially DHA) mainly for proper functioning: improving memory, concentration and logic thinking. Adequately high doses of DHA helps inhibit the development of dementia in the elderly and improve all cognitive and executive functions. When talking about omega-3 fatty acids, we should not forget about omega-6 acids. The last ones contribute to releasing proinflammatory hormones, that is why the proper ratio of these fatty acids is so important. EPA and DHA make the opposite and show a strong anti-inflamatory action, inhibiting the release of proinflammatory hormones in our body. The recommended ratio of omega-6 to omega-3 fatty acids is 4:1 or 5:1 whereas the ratio in the diet of most people is 20:1 and more. EPA and DHA has many health benefits. Apart from their anti-inflamatory action, they are involved in building cell membranes. Pregnant women should especially provide adequate amounts of these fatty acids, because they are critical to normal child brain development and form the eye retina (omega-3 deficiency in pregnancy can cause a greater tendency for a child to have visual impairments). Studies have shown a number of advantages of healthy serum omega-3 levels. First of all, the consumption of EPA and DHA improves the condition of the heart, regulates its function and prevents heart attacks. They help to regulate the lipid profile by decreasing blood triglyceride levels as well as increase the overall immunity of the body and that is why they are recommended for colds.Omega-3 are extremely important in disease entities with particularly severe inflammations, e.g. autoimmune diseases or RA – rheumatoid arthritis. Undoubtedly, EPA and DHA are highly significant in the athlete’s supplementation. Studies show that increased omega-3 intake improves insulin sensivity and consequently contributes to increased synthesis of muscle fibres and decreased blood glucose concentration. Anti-inflammory properties help an athlete to regenerate quickly, hereby reducing the effects of microtraumas formed during training sessions. 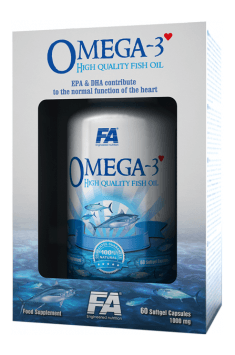 To sum up, FA Omega-3 is a careful selection of high-quality omega-3 fatty acids whose supplementation leads to the improvement of brain function, reduction of inflammations and protection of the heart and cardiovascular system. A high content of EPA and DHA perfectly corrects deficiencies due to a poorly balanced diet, consequently improving our health. 2-4 capsules during a meal with water. Do not exceed the recommended dose. Concentrated source of unsaturated fatty acids. The product contains the optimal dose of essential fatty acids, so do not exceed the recommended dosage of 4 capsules a day. With a really well-balanced diet will suffice 2 capsules. Always we eat them during a meal with water. I recommend athletes - omega-3 accelerating regeneration after a workout and improving their fitness. At regular supplementation will also benefit people who want to improve the lipid profile, the product helps reduce the level of cholesterol in the blood. Fitness Authority is a well-known Polish manufacturer of sports diet supplements and sports nutrition. Among the products of this brand are fat burners, supplements to accelerate muscle mass gain and products providing vitamins and minerals for the body . The company also offers protein supplements, creatine and regeneration supplements and high protein bars and protein drinks. Capsule (gelatin coating, firming agent (glycerin)), purified water.